Two years after its release I finally found an occasion to sew up the Anna Dress. With a wedding coming up, I knew the silhouette was perfect for both the occasion and the floral fabric from my stash. Plus, this dress looks so effortless and beautiful on just about everyone who sews it. I finally had a reason to get in on the action. Isn't she lovely? The measuring, of course, was the start to all my problems. Or rather, the pattern's problems. Pulling out my tape measure forced me to compare the pattern to other patterns I own, and I began to notice some very odd things. For starters, the front was too small at the waist, even compared to my usual knit patterns. This is especially odd when considering it is drafted for wovens. I delved into some pattern reviews (the benefit of sewing up something after everyone else has), and saw that, indeed, the front pattern piece is drafted too small. To accommodate, the back piece is drafted wider, resulting in the side seam pulling toward the front. Of course this led me down a rabbit hole of online reviews. Almost no one, it seems, had sewn up the pattern precisely as drafted. 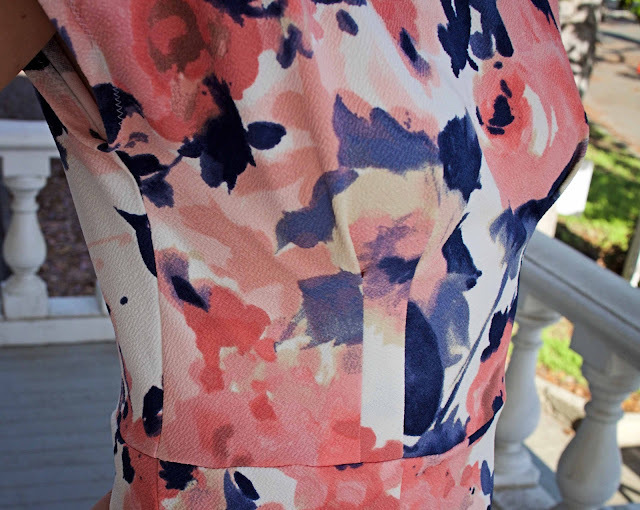 In addition to the side seams, many people rotated the shoulder seam forward and made the neckline smaller. Others recommended a small bust adjustment, even though lots of sewers were a B cup or larger (the size BHL patterns are drafted for). I started to find versions that hadn't quite worked out, and read about copious bodice adjustments on Pattern Review. And while we're on the subject of Pattern Review, it's interesting to me how many people rated the pattern "Highly recommend" but then listed several modifications they had done or would do to make the pattern work. Hmmmm. So much for my $10, I grumbled. First, I extended the width of the front and narrowed the back at the side seams so the seam line would hang straight and not slant toward the front. I used a pattern that fit me well and my personal measurements to calculate the amount to change. This amount may change for a woven fabric, but would need to be corrected on any version. After making a muslin, I also shortened the bodice in the front between the shoulder and the natural waistline. This eliminated the droopiness that I saw on a lot of versions, and pulled the shoulder seam forward to where it should be. I think BHL may have lengthened the front bodice to accommodate the bust instead of doing something akin to a full bust adjustment to make more room. This causes all sorts of droopiness, especially for anyone in the smaller bust range. After this adjustment, the muslin hung much better on me and everything felt like it was in place. (This also makes the front arm opening smaller than the back, which is OK and actually true to your body's shape, especially for a hunchback like me. Depending on your measurements, you may also want to extend the length of the back shoulder some to get the seam line in the right place and have enough room for your arm). Finally, I straightened the back waistline, which sloped down toward the sides, and trued it with the front pattern. If I were to make this again, I would also lengthen the bodice at center front, as this part pulls up and doesn't sit quite straight. I'm not sure if these are the technical ways to address all these problems (especially shortening the bodice), but this is what worked for me when I was pinning up the muslin. I narrowed the neck opening at both the front and the back, as I have small shoulders and many people commented that the neckline was rather wide. I also eliminated the seam allowance at center back, as I found that I could easily slip the bodice over my head when sewn in the knit fabric (BHL comments on this on their sewalong as well). I did not need to adjust the size, as the bodice fit quite well at the size indicated on the pattern after adjustments. If I were to sew this in a woven though, I would definitely need to size up. As soon as I thought all was said and done, I started in on the skirt. While I knew the side seams would need to be altered to match my changes to the bodice, a reviewer also alerted me to the weird shape of the pattern pieces. 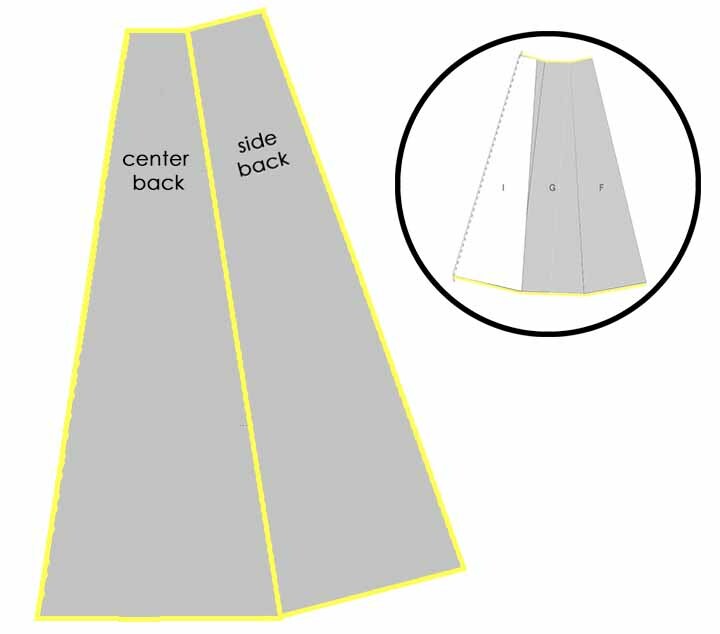 Drafted as trapezoids, when sewn together they create weird angles at the waist and hem rather than smooth lines (pictured below). This is even illustrated in the pattern instructions (pictured in the circle, with highlighting added by me). I'm not really clear how BHL expects you to deal with these weird seams. Smooth them out yourself? Hope they go away when you join the waist and hem the bottom? As the reviewer put it, it is a sign of poor drafting. Changed the width of the front and back side seams to echo the changes I had made at the bodice side seams. Straightened both sides of each of the four skirt pieces at both top and bottom to create a smooth join between the pieces. Removed 4 inches of length, which still accommodated a floor-length skirt with heels (I'm 5'7"). The knit fabric might have required me to remove more length, but even many of those sewing it in woven fabric had commented that the pieces were too long. The end result is beautiful. I love the fabric, and the silhouette is great. But the product itself was very disappointing. 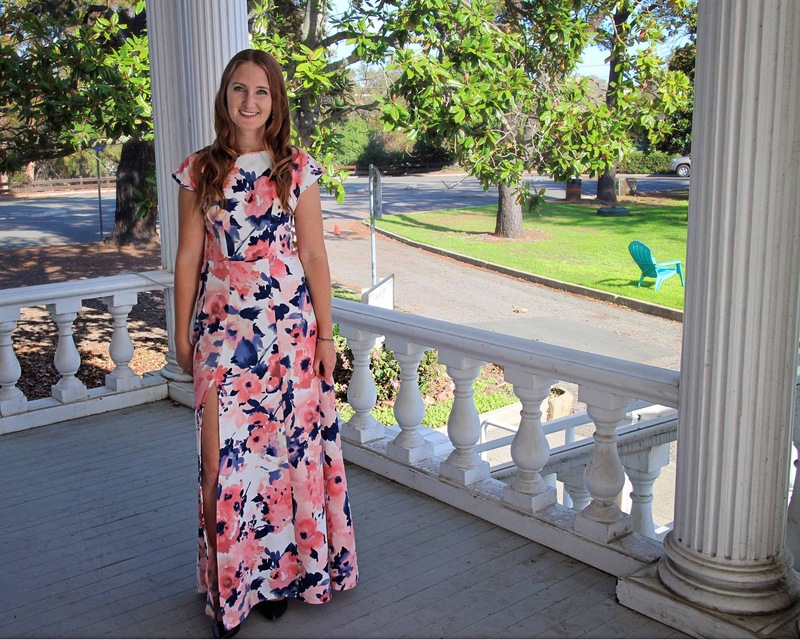 The Anna Dress is not a pattern, but rather the idea of a pattern. By Hand London sells the idea of a flowy dress, modeled by gorgeous women in pretty fabrics, with a unique silhouette that has captivated many. Experienced sewers have done a great job of sewing her up, with the many modifications needed to make her work. But the actual pattern pieces that you get are poorly thought out ideas. I would expect to see these lines in an initial sketch drawing but not sold for $10+ to consumers. After seeing so many great versions, I realized I only had to scratch the surface to find that many people had real issues - and made significant changes. The wonky side seams and shoulder seams, slanted waist seam, and angular hem were a real disappointment. Sure, many people found that it was easy to sew up, but this pattern has too many drafting errors to pass muster. In the end I got what I wanted, but I will not be buying BHL patterns again. I am sorry to hear that this pattern was such a bother, but not surprised. =/ For what it's worth, your finished dress is really lovely and it looks great on you! The fabric is stunning. I made this pattern as well--the design was exactly what I had in mind for my fabric. (So I love the design, but not so much the end pattern, if that makes sense! In hindsight, I consider it to be badly drafted and amateurish in that regard.) Since I always require bodice adjustments, I didn't spend too much time analyzing the draft beyond doing my fitting. (I was on a self-imposed deadline to finish!!) But by the time I got to measuring the skirt pieces, I got pretty mad about the length: it is absurd!!! 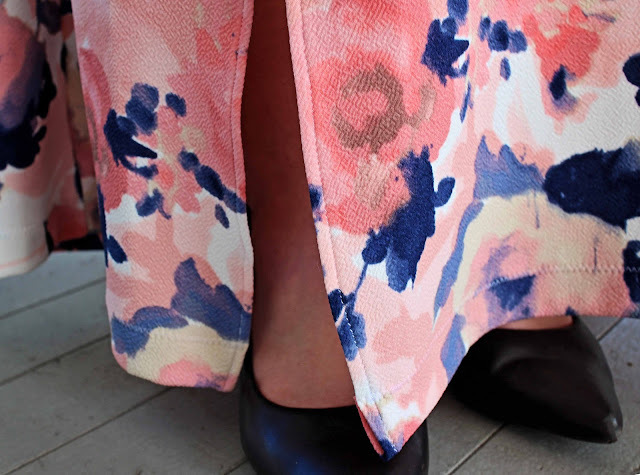 I am nearly 5'9" and still hacked about 4" off the skirt pieces. "Proportion" is clearly not a word with which the designers are familiar. >=[ I am just glad I measured them BEFORE hacking into my gorgeous ombre silk! I suppose it is good for my stress levels that I didn't take more time to dissect the drafting beyond that until AFTER I had finished, eh? =D Thanks for sharing your experience. Totally agree! I made several muslins and two dresses, both with significant adjustments, particularly to the bodice. One dress has been worn twice, and both times (probably because I made a very large FBA) it has ridden up. I can wear it if I only intend to stand there and look nice, but if I intend to move, no good. The second has been worn once for the same reason, no point if I'm not going to be able to move. I realise from reading your post that drafting errors and strange bodice shapes are likely to be the culprit, instead of blaming myself and my adjustments! I wanted to like this pattern, and I tried, but it's not going to be one I try again. Such a shame. I'm glad it's not just me who had these issues! P.S. Yours does look gorgeous though, worth it in the end! Thanks for a frank review. I don't sew this company's patterns, but it was interesting and refreshing to read your experience. I love your dress anyway! I made this when it came out and there were no critical reviews of it at all. I thought the numerous problems were down to my beginner level sewing skills. TBH it put me off sewing for a while. Later, I started learning pattern drafting and decided to try again. It actually was easier (for me) to draft from scratch rather than fix their pattern. Like you said, it's a good IDEA for a pattern. I did attempt another pattern from this company which didn't go smoothly either. I don't think I'll be buying any more! Beautiful work as usual! Thanks for the detail- I've been eyeing alix for holiday parties but not really up for a bunch of money spent on a drafting puzzle. Keep up the candor! Thanks for the comments everyone. It makes me so sad that a lot of people blamed themselves when this pattern didn't work out! Thank you for this honest review! I'm astonished by the trapezoid skirt pieces! Yours, and other recent reviews have really brought to light the serious drafting problems found in some independent pattern lines, and have saved me both money and frustration. There were several dress patterns on my list of "wants", that I now realize wouldn't be at all worth it to me, because of the extensive changes needed to make them work. I really don't understand how pattern companies think they can justify the price they charge for shoddily-drafted patterns. 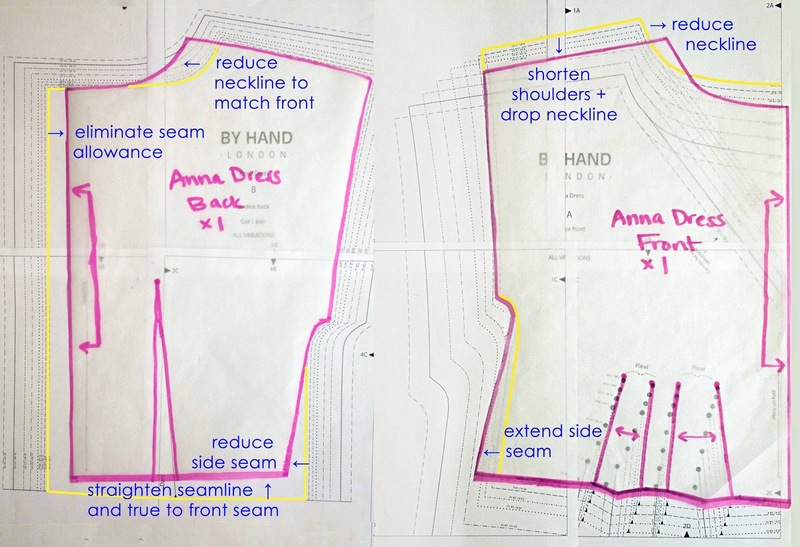 "The Anna Dress is not a pattern, but rather the idea of a pattern." An astute observation that I think is true of most of BHL's offerings. They excel in the idea stage but when it comes to actual drafting, their patterns fall flat. I made a Flora dress, the wrap version, and had similar problems to what you've encountered. The side seam swung wildly towards the front and caused horrendous drag lines that many other people who had sewn the pattern noted. I ended up doing a massive FBA and adding a lot to the front waist to balance that seam. Not quite sure I succeeded. The other problem I noticed was the included ease - if I had sewn my advised pattern size, I would have had 1" of ease in the bust and waist. Hardly sufficient to breathe, let alone move around! I have always liked the design but I have never bought it because I have read to many negative reviews. Your review is the best till now the most honest. And at least you didn't blame yourself! It's refreshing to read an honest review. The dress looks fantastic on you but I don't know if I will rush to sew this pattern up any time soon. Of course there are corners of the internet where beautifully-drafted and strikingly-original indie patterns can be found, but all too often they are mediocre at best, as you have demonstrated so clearly here. Your lovely result is due entirely to the fabric and your skill and hard work; no credit is due to the pattern. Thank you for such an honest and thoughtful review. It's refreshing to read a review that doesn't sugar-coat issues the writer faced in creating the garment, something I see a lot in other blogs. I purchased this pattern when it first came out because the design was so striking. Now I regret the $20 I spent on it! This is why I don't buy patterns from independent designers...I enjoyed your frank review. Your dress looks so lovely and the fabric is gorgeous. I often wonder why people buy these basic, basic designs from indie pattern makers. Even if they were drafted perfectly (as some probably are) there are multiple patterns out there that you could buy at a thrift shop for .50c.... people gush over peasant blouse and t-shirt patterns that some designers give out for nothing. A really frank review that is overdue and welcomed. Another thank you for the honest review. I really love this silhouette and have been tempted by this pattern so often - but amongst the many great versions I've seen sewn, several bloggers mention but gloss over the issues you've picked up on. This post is the nail in the coffin, another indie who won't be getting my custom. 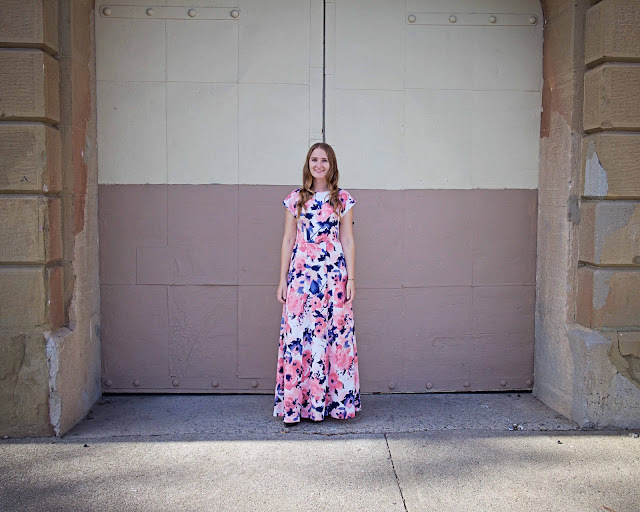 I have made this pattern up several times (not maxi length). Made no adjustments and it fits perfectly. The Charlotte skirt was another matter, never completed mine. I think this is a great pattern but obviously won't work for everyone. Thanks for the honest review! I had a similar problem with Grainline's Portside Duffle Bag, there were some major issues in how the dopp kitt was drafted and after pouring through reviews, only two blogs mentioned the issues they had. I think it can be hard to give negative reviews about products online. We all know that (usually) these small scale pattern companies put a lot of thought and effort into their work and no one likes to criticize that hard work, but when it comes down to it, poorly drafted is poorly drafted and that's all there is to it. Thank you for your honest review. We need those in all aspects of our lives. Thankfully, your frustration netted you a beautiful dress (and a great line I've already seen quoted, "The Anna Dress is not a pattern, but rather the idea of a pattern."). I'm sorry it took so much unnecessary time and effort to get such a nice result. "We all know that (usually) these small scale pattern companies put a lot of thought and effort into their work and no one likes to criticize that hard work"
But what about the work WE put in to earn the money we use to purchase their products? No one should feel bad about or intimated by writing an *honest* review. Those who sugarcoat should maybe feel bad about a dishonest review, especially when such reviews lead fellow sewists down the road of self-doubt. Thank you SO much!! I love my Anna and still wear it on every occasion that I can as it fits great and looks smashing - I once tried to make another and cried as I couldn't make it look the same. The first was fitted to my body by a sewing friend and the pieces resemble yours more than the originals, I'm not quite ready to tackle it again, thank you for shedding some light on maybe why that is. Thank you for writing such an honest review. I had the exact same issues with the bodice 2 years ago and it was incredibly frustrating, especially since I was still very much a beginner and was so excited about the pattern. After making the Anna and reading an extremely unprofessional comment posted by BHL on someone's blog (in response to an honest but critical review of their patttern) I also decided to steer clear of BHL. I think this pattern was maybe the third time I had done a small bust adjustment. I just reread my post on my first Anna dress and realize that I made three muslins of the bodice to get it to fit right. All the work was on the front bodice pattern piece. I was really happy with how my fabric worked with the dress so I didn't really give the pattern's flaws much consideration. Thanks for pointing out the problems, which I couldn't really articulate at the time - likely because I stayed up late sewing it up. I love the first Anna Dress I made and wear it a lot. If I were a beginning sewist, I'm sure I would have given up on it. It's the only BHL pattern I've made. Thanks for your frank assessment! I did not sew the Anna dress, but I did make up the Elisalex dress. I had the same problems as you around the shoulders and neckline, which leads me to believe this is an inherent problem with their block. The skirt proportion is total bullsh*t on my 5'1" frame so I replaced it with the Simplicity 2444 skirt. That ended up being the redeeming bit because I eventually ripped out the skirt section, added a waist to it, and made it into a standalone skirt. You're right that it's perplexing that so many reviewers on Pattern Review recommends the pattern, but when you dive deep into it, people either had to do multiple muslins or do quick fixes on the fly. That's so dishonest! I too, like many other commentators here, thought it was my own amateur fault. I mean, the pattern bears the name of the founder! I didn't expect it to be so flawed! I've given away my Elisalex pattern at a swap. I still have the Victoria blazer pattern. But I just can't bring myself to sew it. Hi Meg, great post, excellent review. I would just like to add I think you were very clever on addressing the issues you noticed; I know I would have tried and tried and never would have succeeded. I have this pattern, I also love the silhouette, but will save it for a faraway future when I have time and patience. Wow - what a great and honest review! I think your dress looks amazing despite your issues. I've made Anna a few times when I was first starting out with sewing, and I found it quick and easy to make, but I never used the skirt pattern pieces, I always added a gathered skirt. I have made the Kim dress, and while I liked it, it took a lot of adjustments to get it to fit, and it's still not exactly how I'd like it. I really commend you for your honest review. Also, I've been swooning over that fabric. Can you tell us where it's from? It looks so gorgeous! Oops I'm a bit late replying to this! The fabric is from Fabric Mart and is called "Peachy Pink/White/Dark Blue/Multi Watercolor Floral Print Poly/Lycra Textured Jacquard Double Knit 59W." It was only $4.40/yd which was very cheap! I bought it back in August so I don't think it's available any more. Good florals are hard to find! Great review, thank you! I bought the pattern even though I'd perused reviews and seen there were problems, and I bought fabric because I just know it will look great in this shape. When I saw the line drawings of the skirt, I realized this was going to take some concentration, so the dress has been sitting on the back burner. Thanks to your review, I have a fairly clear idea of what I think I'll need to do, even though you and I are completely different sizes/shapes. Your dress came out great! Thanks Marilyn, good luck! I do love the dress if you're willing to put in the work! It's refreshing to read a review that is not all sunshine and rainbows. As I am working to increase my garment sewing skills, it's helpful to know which patterns to avoid. I want my challenges to be focused on garment construction techniques and fit...not trying to overcome pattern drafting issues. The digital economy allows anyone to put together a pattern and offer it for sale.....I'm now spending more time reading about their qualifications and experiences before I plunk down $15-$20! I love the look of this pattern and last Summer I decided to give it a try. I found I had a bunch of issues-- I had to do a small bust adjustment, do some work on the neckline, adjust the darts, etc. I think I made 2 or 3 muslins of the bodice and put it aside. Of course now I can't even remember whether It was OK or still needed work. Now that I read your review and adjustments I think I would benefit from starting over and making the changes you made. I can't say that I'm rushing to fiddle around with it but I would like to get it right eventually. Your turned out beautifully in the end. Another idea may be to take a plain bodice that fits you well and modify it to resemble the Anna. Turn any waist darts into tucks or put tucks in a more loose design, make a muslin or two, and you've drafted something that will fit you even better! You can even use the Anna pattern for reference since you've already purchased it, but a better-fitting pattern as your base. I just saw a dress pattern on etsy that is very nearly the same style as the Anna, and wondered if you might like it. 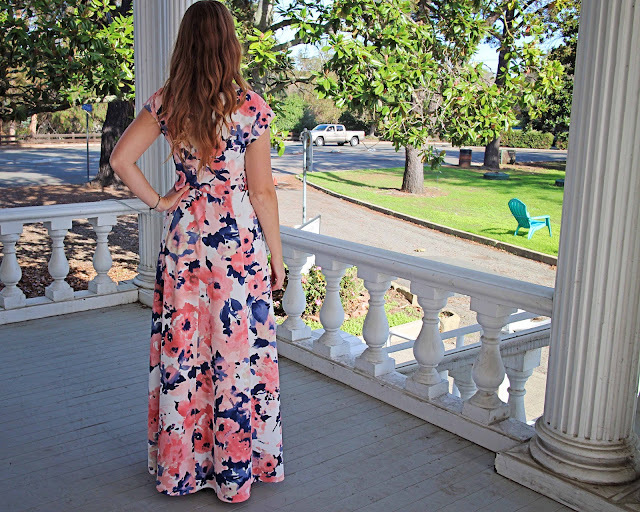 Butterick 4435, has similar lines.